More Sherlock Holmes pictures. Specifically BBC!Sherlock. Although the above picture seems to have turned out to resemble the movie version of the characters more. Partly because I put them in Victorian clothes, those being more fun to draw than modern day childrens' clothes. 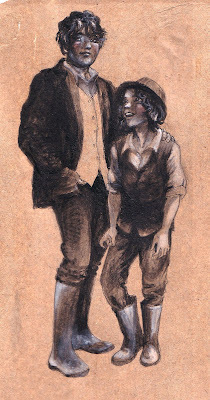 Possibly I've spent too long working with children's books, but when I thought about how popular pictures of young Mycroft and Sherlock were, and how their parents are always absent giving the impression that Mycroft is raising his brother singlehandedly, I thought of Lauren Child's Charlie And Lola books. 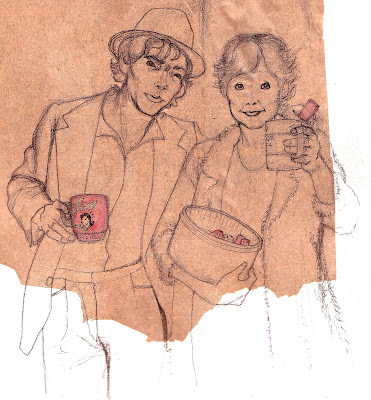 Then I thought of 'I have this little brother Sherlock...', giggled for half and hour, and doodled this. Then I went to have a quiet lie down and log hard think about my life. Didn't work. I still think it's funny. Finally from my page of Sherlock obsession is one of Sherlock Holmes and Mrs. Hudson. For some reason. She was meant to be toasting the view with her mug of cha, but it looks more like she's offering it to whoever she and Sherlock are talking to (Lestrade? ), which I rather like. To me it looks like a scene taking place after some dramatic denouement at 221b Baker Street: Mrs. Hudson's providing the police with tea and biscuits and Sherlock Holmes looks very pleased with himself. He also looks like Kevin Bacon and has a weird neck. Which is a shame. And controversially, his biscuit of choice is the pink wafer. Why did I draw this? I think it may be time for another quiet lie down.